Wow, it's been far too long since I wrote a feature on my blog! I'm feeling rather guilty about this but I'm now determined to get back on a roll with it. So to kick-start it off again... it's the time of year for wedding shows and last Friday I went along to the Designer Wedding Show to take a peek at all my fellow suppliers. I went along with Michelle from Pierre-Carr, a destination wedding planner. 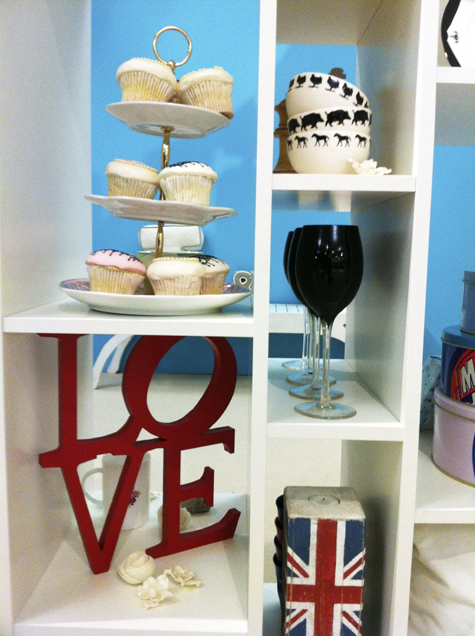 I thought I would mention the suppliers that stood out for me, the ones who's products caught my eye. I also bumped into other people from the world of weddings so I'm going to give them a mention too! Wedding planners Tiffany from Grant Riley Weddings, with her gorgeous little boy, and Andri from Always Andri Wedding Design. Cake maker Samia from Vanilla Cake Shop, and bloggers Annabel from ,strong>Love My Dress, and Kat from Rock'n Roll bride. I hope all you ladies had a fun day at the show. Our first stop was at the stand of Susannah Hunter. 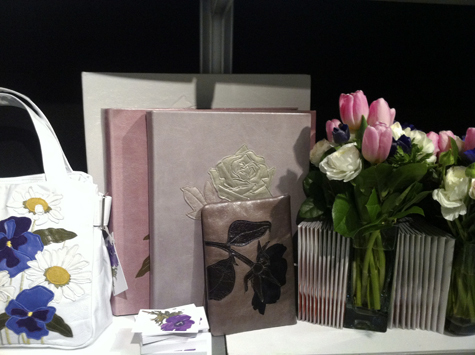 She makes leather appliqué handbags and furnishings. 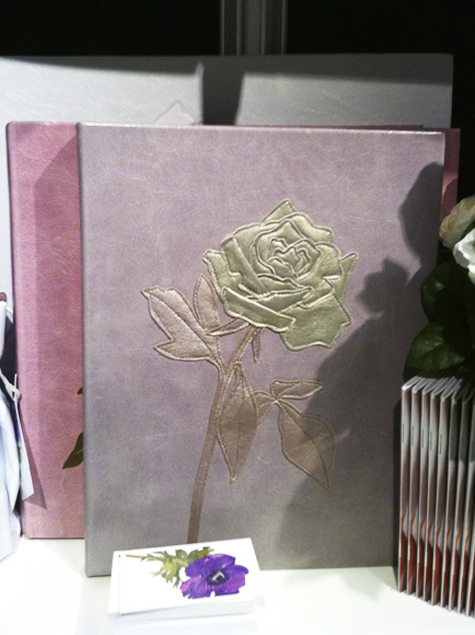 I spotted a gorgeous album that would be ideal for a wedding gift or for your own wedding album. I was told that they could make you an album in the colours of your wedding and also appliqué a flower on the front to match your bouquet. Other gift ideas that I loved were from Not on The High Street. I love the products they sell and I adore their imagery too! 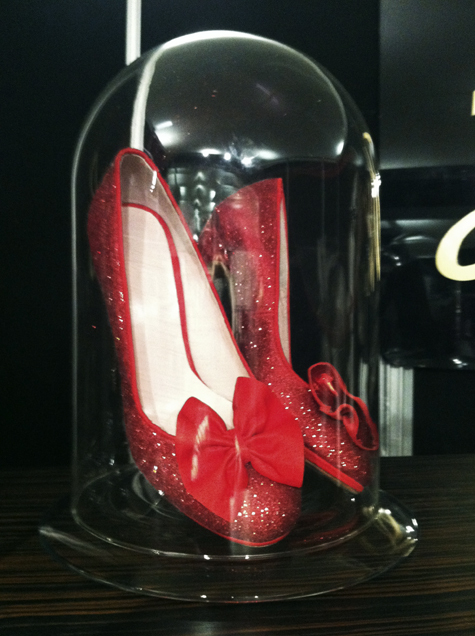 The shoes at Harriet Wilde caught my eye as I wondered by, especially the sparkly, ruby shoes below, they are just great. The company is owned and run by Ruth, who is absolutely charming. Jo Heckett produces the most novel wedding favours I have ever seen. 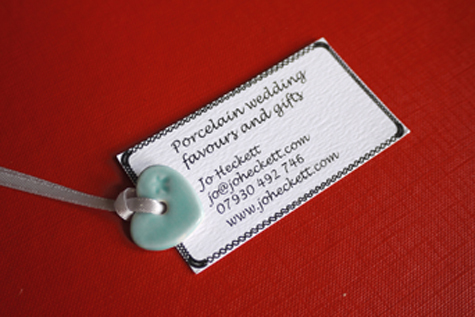 She designs and makes porcelain wedding favours and gifts. The image below is an example of a place name card. 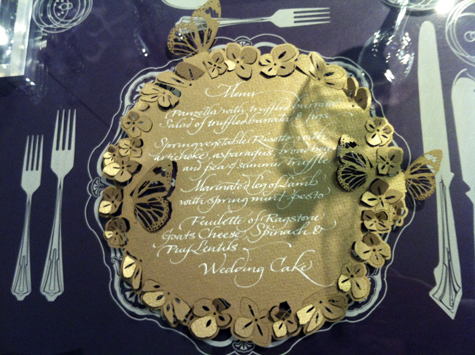 She had many different designs and all can be individually personalised. 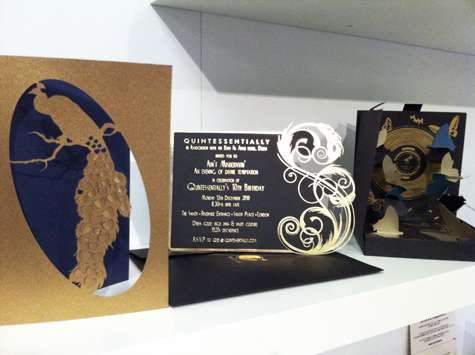 Cutture are an exciting company who design and make stationery. 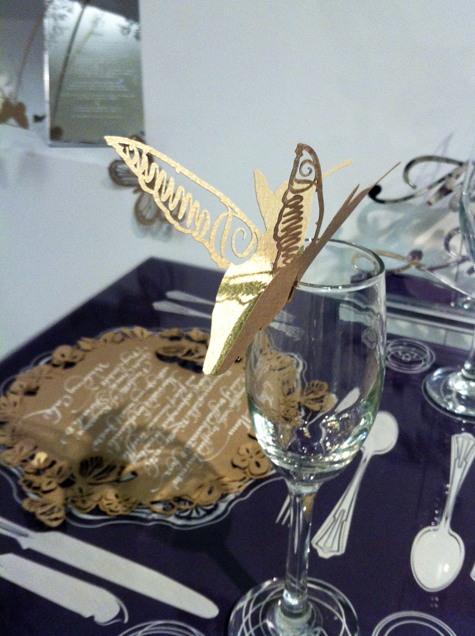 Their ideas are extremely creative and they seem to be able to design pretty much anything out of paper. There were a number of gorgeous venues on show, including the amazing Coworth Park where we shot Meredith and Ben's wedding in September 2010. 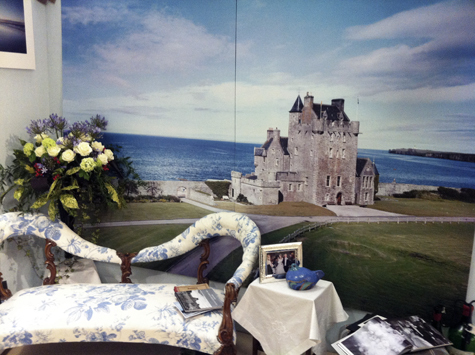 Ackergill Tower is a stunning tower located in the serene Scottish countryside, as you can see from the photo of a photo below! Others to mention are Hengrave Hall in Suffolk, Rennaissance, London Chancery Court Hotel, and Claridges, London. Finally, London Syon Park is a new venue under the Waldorf Astoria Hotel due to open in March. It will be a very tasteful and luxurious boutique hotel.